BABY VS MUMMA | Can baby wipes double up as cleansing wipes? I'm off on holiday to Cyprus in a few weeks, and am thinking about ways to fit everything into our 40kg Easyjet weight allowance. Normally this would be enough for two of us, but babies don't tend to travel light! As far as beauty products go, I'll obviously be stocking up on minis (bizarrely one of my favourite things about travelling is buying minis), but I've also been thinking about which of Lucy's baby products I can use. We all know that baby wipes are invaluable for all sorts of uses. I honestly don't know how I coped without them in those heady babyless days of yore. But one thing I've never tried using them for is a face wipe. In theory, these wipes are super gentle as they are made for cleaning babies bums, so a face should pose no issues. However, I've seen Huggies wipes get paint out of a carpet with relative ease, which doesn't entirely inspire confidence in those 'sensitive' claims! Anyway there's only one way to know and that's to try them out. So I spent the better part of Lucy's afternoon nap yesterday putting on makeup and taking it off again with some of the more popular wipe brands. I haven't done them all by any means so if any of you lovely readers want to give the ones you use a try and post your review in the comments, please do! I really need to iron my sheets!! 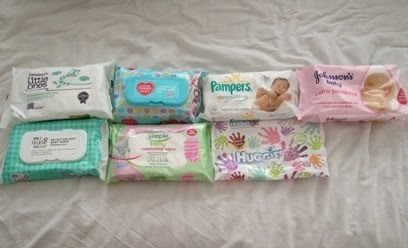 On baby: These are ok once you get used to them but they were quite dry wipes and didn't feel that soft on baby's bottom. On me: These felt a little rough on my face, however I removed my foundation and mascara easily with one sheet. The skin around my eyes felt a bit prickly afterwards. On baby: These are quite wet and feel more like you're washing baby's bum, which means you need a towel or tissue to dry it but at the same time you feel like the end result is much cleaner. On me: These felt quite soft on my skin and I removed my foundation and mascara with ease using one sheet. I think maybe because the wipes are wetter and possibly more astringent, once my skin started to dry it felt really prickly on my cheeks and eye area. On baby: These are fine for baby though they felt rough in my hand so not sure how it felt on baby's bum! On me: Again, these easily removed the foundation and mascara. After use my skin felt fresh rather than prickly but the wipe did feel rough against my skin. On baby: These felt better quality than the previous three and had medium wetness. Fine for use on baby's bum. On me: They removed my foundation and mascara well and felt soft on my skin but again I felt a lot of prickly tingling on my skin afterwards. On baby: These wipes feel the nicest, they are extremely soft in the hand although not very wet. Unfortunately this can make it difficult to get them out of the packet in one piece! Ok for wiping up poo but I needed to use quite a few to ensure a clean bum. On me: These did remove the foundation and mascara well but this was the only brand where I needed more than one wipe to get my face clean, particularly the eye-makeup. There was no prickly feeling though and my skin felt less tight and dry afterwards. On baby: These did the job well, felt quite soft and are medium wetness. On me: These were the best on make-up removal, perhaps unsurprisingly. The wipe felt reasonably soft on my skin and though my skin did feel really clean afterwards, it was still a bit prickly on my cheeks and eye area. On baby: These feel really soft in my hand and they have slight ridges which I suppose serve to capture the poo more effectively! On me: They felt quite rough on my face and though my skin did feel really clean afterwards it also felt probably the most prickly. It did take of the make-up easily though, so maybe this one is good for a light exfoliation as well as cleansing! If I can find a good deal I think I'll take some Simple wipes on holiday with me. Probably not as a replacement for cleanser, but they'll be good in a bind and also on those nights when I'm too tired/drunk to do the full cleaning routine on my face. I might give those a try then. Anything biodegradable can only be a good thing! You have missed Tushies baby wipes. They are very nice and gentle to skin.